I recently had tested how skirmishers matter for fire combat and came to the result that they only matter if the fire passes a hex with a skirmisher unit in it, in this case the fire value is lowered by 20%. 1. It doesn't matter if it's a friendly or enemy skirmisher unit. 2. Even if the fire passes multiple hexes with skirmisher there is only a single modifier of -20%. 3. Having skirmishers in the same hex as the target unit doesn't give any modifier for fire combat. I thought that it's the same for melee but Feldmarschall Pfluecke made me aware that this is not the case. 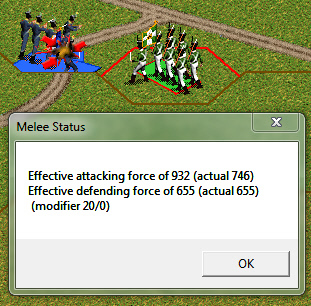 Now after testing skirmishers in the same hex do matter for melee and so does their facing. Another prove that the engine has some hidden qualities, but it gets complicated here as the skirmishers have no visible facing in the unitbox, one has to look closely how they are positioned in the 3D view. 1. French battalion in line gets attacked from the flank. A. Russian unit A quality gives +20%. B. French get attack from a hex they are not facing. Russians get +40%. C. Russian unit didn't fire and the French battalion can't fire at them even if it held its fire because the Russian aren't in their firing arc. That gives +20%. - That sums up to +80% for the Russian attacking strength. 2. French battalion in line with skirmishers facing away from the enemy gets attacked from the flank. - Although the Russian unit held its fire the French skirmishers also didn't fire and by that negate the +20% as the French skirmishers are able to fire at the attacking Russians. 3. French battalion in line with skirmishers facing the enemy gets attacked from the flank. 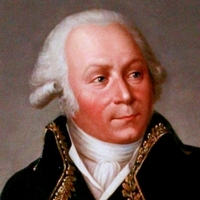 - Although the Russian unit held its fire the French skirmishers also didn't fire and by that negate the +20% as the French skirmishers are able to fire at the Russians. So one can see that skirmishers can negate modifiers in the amount of 60%, that can be a big difference for a unit attacking from the flank. I had never noticed that skirmishers could do that - negate the flank attack. Definitely not something I agree with but oh well. Its been there all these years. For cavalry stacks we all turn our squadrons every which way to negate the flank bonus. That is pretty standard. Well a complete negation is maybe too much, if they would lower the flank bonus it would seem OK in the end they were just there to protect the flanks. In the end all the people whining about the too high stacking can be relieved to protect their defending units in this way from additional bonus of an attack that they thing is too large anyway. Very interesting... I usually ignore the Skirmishers' facing.. so this will help. What games does this apply to? HPS and BG/Talonsoft..? HPS/JTS, not sure if goes that way in BG too. Yes, the same is true of the BG games. I consider a skirmisher screen being used to disrupt the flanking column bonus a gamey tactic. It is on the same order of deploying a line infantry skirmisher. Extending, then combining the skirmisher then, deploying two skirmishers. The skirmisher 'moved to top' should affect it's underlings just as line infantry might deny those underneath fire and being targeted. All of these would be examples of lack in bugfixing or improvement with the series despite counter claims. Now using a cavalry platoon to deny the bonus is problematic but, not directly exploitative. For one it's a bug, for most others a feature. It can be considered that these men are an extension of the line used in a way to just to that, provide flank cover. Just look at the Prussians in 1806 that showed a form of flank protection with their Crescent formation, how do I do this in game terms? By using skirmisher function, and as most normal units can only bring out 1 skirmisher unit it's basically only there to protect the open flank at the end of a battle line where I see no problem at all with doing that. Extending a unit is another thing but it makes the unit vulnerable and makes only really sense it very large battalions where each "section" can stand up to a usual enemy battalion. The benefit of gaining 2 skirmishers just doesn't make up for the problems coming along with it in regular situations with normal sized units. Maybe special situations make it worth it but then again special situations can show special behavior on the battlefield, if that results in an extended line with skirmishers on both flanks I don't see a problem. It's obviously not WAD from a gamer's POV because A) the isometric graphic overlay isn't showcasing a solid defensive refusal that might hinder an entire battalion or cavalry squadron in it's assault at the flank of the superior deployed unit. Nor, the skirmisher's facing in top down view. B) Logically, a unit in skirmish order retreats and doesn't pose disadvantage against an assaulter. Game tactics like this are poor sport and uncompetitive I say again. Why dissuade convoluted "tactics" like creating a massive skirmisher block with grand batteries in it's center then encourage intricate sneaky stuff like this? A. 3D graphics show it fine. B. As said don't take this skirmisher unit as skirmisher unit but as company that bent in like the Prussians showed, and if they could show such flexibility most likely all could do it. It's just the same abstract depiction of something that the engine has all over the place, just like columns working as attack columns in the field but on the road as march columns gaining the benefit of road movement. The the skirmishers are not this but just an bended company is confirmed by the fact that benefits that skirmishers usually have like taking just 25% fire are not applied if the hex stacking is over 1/8, what is surely always so if stacked with a battalion. In such a case firing on the bend company will make them take normal fire casualties, not sure how that works for melee but I guess it's the same. Well, if I had to claim it wasn't an exploit than it would be due to skirmisher's able to receive flank penalties (which isn't so) and being U (unit) type counters in the program. Which would show equivalence of base units and skirmishers. I would still see it as a major flaw and loose end in development though. Certainly don't encourage it myself and will never use it in play. If my opponent does than I reserve the right to trash talk. I won't even set an encryption on the *.bte if anyone who min/maxes this much should just want to "win" by deleting all of my units. Thanks for bringing it to everyone's attention. It has modified my behaviour so that I seperate skirmisher's from line infantry whereas before I thought they did give the target bonus to their untermensch kameraden. I'm sure everyone knows about the dual skirmisher exploit. It can be used to create skirmish hordes of course. Friends, don't let friends play like autists. Edit: Dammit, it does make sense. For the reason I stated, skirmisher's cannot be flanked and therefore they should deny flanking bonus at least on one arc of the area being assaulted. Although, it's graphically incongruent it is logical per game rules... You win again you pesky kraut. 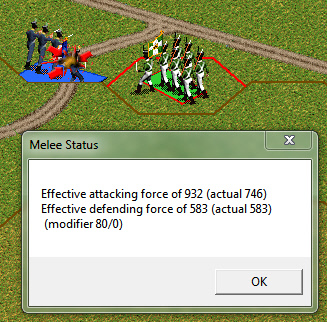 I am also having difficulty recreating the "dual skirmisher line infantry exploit" I brought up. Oddly, I ran into a new exploit while dorking with it by falling in from extension with a skirmisher at the flank giving an already two unit parent the ability to extend into a third. Skirmishers facing negating flank attack bonus has always been there. I don't consider it a gamey tactic. 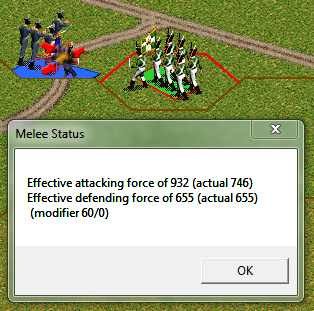 Our simulation has the lowest common unit to be battalion level. If the skirmishers, maybe think of them as picquets are to the flank of the formed unit in the same hex, I've always considered it that they gave the unit commander enough advanced warning that he could react and crochet the line or pivot the battalion or deploy a company or platoon to face the charge. There was a lot of fluidity in battalion tactics that our game doesn't address, nor should it.